This Segment guide will allow you to draw perfectly straight segments. 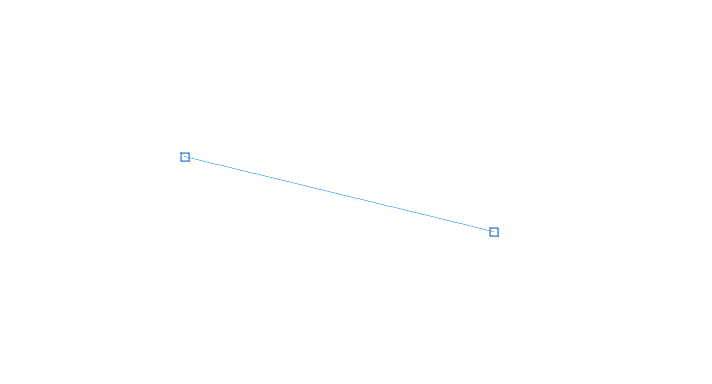 Start by drawing a virtual line (in blue by default) in your drawing area. 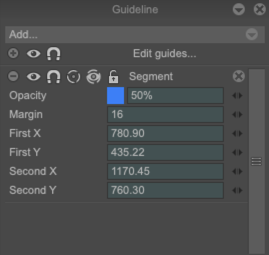 As for the Line Angle, as long as you are not releasing the cursor, you can give the guide the angle you want. A small square indicates the position of the cursor. However, contrary to the Line Angle guide, you can have a shorter line. It is the position of your second click that will determinate the angle and the length of your Segment. Once satisfied, release the cursor. The Segment guide is created. You then have access to all of its options in the Guidelines panel. As for the Line angle guide, the first options (Eye, Snap, Transparency, Margin ) have the same functions and parameters. With the Assist tool, you cannot draw longer lines than the length of the Segment itself. - First X and First Y correspond to the first click which determined the position of the Segment guide. - Last X and Last Y correspond to the second click which determined the angle and length of the Segment guide. The mini-elevators on the right or the numeric fields can help you change these parameters. You can also use the Edit function. You will then have access once again to the small blue squares to manually modify the Segment guide.